Successful Author: How Did You Write That Novel? I love love LOVE going to book signings. First of all, it’s just so nice to sit down in a chair, facing forward, and listen to the dude (or lady) in front. It’s been way too long that I’ve last gone to school. But what I also immensely enjoy at a book signing is reveling in that person’s success story. As a fellow writer, you know just how hard they’ve toiled to get there. The weeks and weeks of too little sleep because you’ve gotten into a habit of waking up at 2 am with an idea and needing to type it up that instant. The times you sit in front of the keyboard and have nothing to say. The other times you sit in your middle schooler’s carpool lime with a billion things to say, but no opportunity to write it down. The endless rounds of editing, the doubts, the rejection… But here they are at their very own book signing, meaning they’ve had some measure of success and possess that most coveted thing of all, a PUBLISHER who actually schedules book tours for them. The question I always, ALWAYS ask the author at a book signing: What is your daily writing routine? Or perhaps they’ve found the magic bullet. Perhaps they’ve run away from their family and are in hiding on the island of Malta, which I just read has the happiest expat population, where they proceed to write undisturbed from 8 am to 12 pm every single day within a stone’s throw of the sparkling blue sea before they seamlessly segue into the mother of all Happy Hours topped by sundowners on the beach. Where was I? Oh, book signings. So the other day I went to Parnassus Books for a book signing featuring Bradley Somer. He of the book Fishbowl, which from what I’ve gleaned is an intriguing plot of a tale involving a goldfish falling from a building and the fate of the various tenants on the different floors somehow tied together by the goldfish’s precipitous rush towards the ground. Bradley spoke intelligently in his pleasant Canadian accent, eh, and after I patiently waited in line to get my book signed, I was rewarded with the nicest conversation. If Bradley were a doctor, he’d have a great bedside manner: He wasn’t rushed at all. We chatted about his debut in a writing contest – mental note: must research writing contests! – and his participation in an awesome writer’s retreat – mental note: must research writer’s retreats but darnit, have already forgotten the name of one he mentioned! – and how to obtain an agent – mental note, must research agents! – and then we chatted about, yes, his daily writing routine. Here he surprised me with some very practical advice. 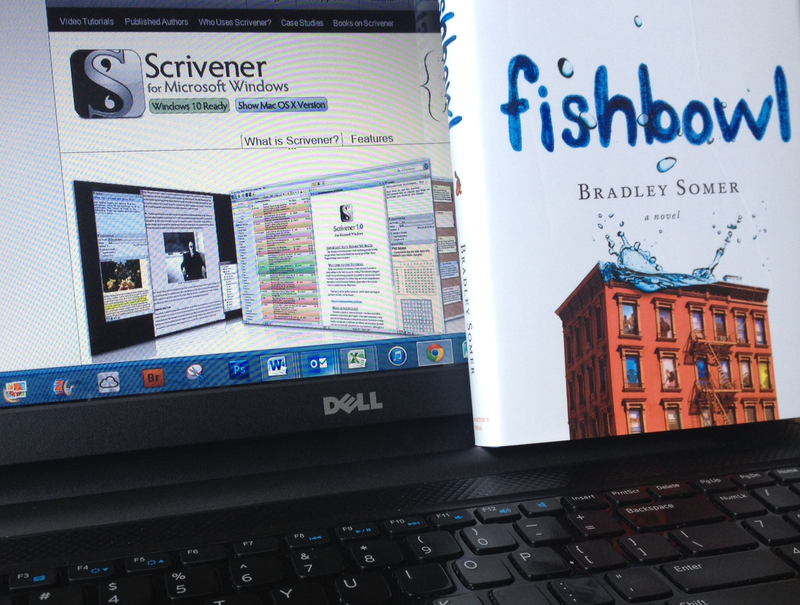 Get Scrivener, he said. It’s a program that lets you manage your project much better than just typing it up in Word alone. You get to somehow set everything up like a storyboard, you get to view your building blocks and random thoughts at a glance and rearrange them at will, and you instantly get to monitor your word count. Whether it also automatically chains you to the computer and only releases you once you’ve reached the magic 1,000, and whether it instantly slaps your wrist when you even just THINK about checking Facebook real quick, that I don’t know. But since super-nice and successful Bradley recommended it, I’m making a mental note to look into it. I’m also making a mental note to contact Bradley should I one day roll into Calgary with my own successful-author-book-tour. I loved the part about her characters coming alive and taking over to dictate the rest of the outline. Stephen King has said as much in his memoir On Writing. This gives me hope that one day I, too, can write fiction. I have some ideas but can’t envision anything beyond the first chapter or two. A good plot always makes me say “duh!” afterwards but seems so hard to all think up on your own. Instead of fretting that I don’t have a detailed plot in mind, it seems like I just have to plunge in and write that first chapter already. Excuse me while I first put in a load of laundry. Your day sounds identical to mine!!! But reading this. I REALLY want to get back to my novel. Where yes, the characters did take over. But I seem to have event less free time here than at home! Our shipment only arrived yesterday though so I’m still holding out for a bit more free time once that’s sorted… Ps Writer’s Retreats are great! I wrote so much of my book at one in Devon. It’s a drug smuggling thriller set in the Caribbean revolving around a young diplomat, a British police officer, an mi6 guy and a corrupt politician. Plus a side story about a drugs mule. It’s got waaaay too many characters at the moment and some storylines that basically need to be shown the door. But I know more or less how it ends now. I actually started writing it when my youngest daughter was two… She’s now nearly eight! I’ve barely touched it in four years. Thinking of doing n online novel writing course to help me work on it as I know there’s a lot of work needed! As a friend of mine just reminded me, November is coming up with NaNoWriMo, you know, the novel writing thingy. Only 1700 words per day, piece a cake! What do you say, we should form a pact and get going. Love your plot! You know, funny, I just had this inspiration the other day that I could write a novel set in Joburg that has a drug smuggling/corruption/illicit love story revolving around Fifa and the World Cup. Somehow featuring an expat wife drawn into all of this… But that’s just about all I know right now. And you know how gave me the idea? Friggin’ Ernest Hemingway and his terrible writing. He has not plot in Sum of All Fears, set in Paris, and I thought, that could be done so much better. I as in ME ME ME could do it better!